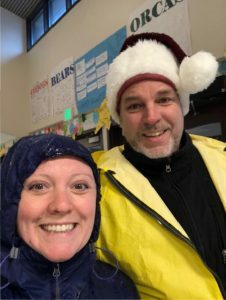 Each December for the past 11 years, students and teachers at Nisqually Middle School have taken on a special ho-ho spirit of Christmas. They become Santa’s best helpers. With the help of teachers and under the direction of Kristin Sprague, the school’s ASB officers put together boxes of food and gifts for 11 needy families. 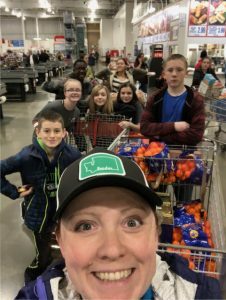 Nisqually Middle School’s counselors designate about a dozen students and their families to receive the Christmas gifts and food in the school’s adopt a family project. It’s based on need. The counselors contact the families to say they want to support them with a meal and gifts and ask if they want it. Each year a Christmas tree is put up in the school and the children’s gift-wish of each adopted family is written on a tag and hung on the tree. All of the tags on the Christmas tree get pulled and the gifts are bought by school staff members, student families, and by families of a church that meet in the school on Sundays. To know what to buy for the gifts, the family or the kids are asked to fill out a wish list. That’s three gifts per child under the age of 18. 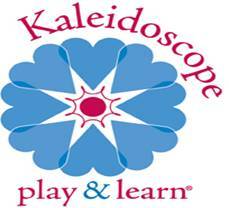 The gifts fall under three categories – something educational, a clothing item, and a fun item. Then the school also provides a meal. That meal varies, depending on the family’s needs. Food items vary from bread, candy, a frozen turkey, stuffing, potatoes, or a ham. “We have a budget and we work with that and see how much we can get for each family,” Pitts said. With the money donated from teachers, students, and community, the ASB students go with Sprague to the grocery store to buy the food. Over the years, Safeway and Costco have donated food items. Then the ASB students put the food they buy with Sprague in the boxes and students wrap the boxes with Christmas gift wrapping. And Sprague said the students like putting “cute” messages on cards in the box. 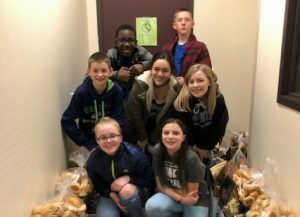 So for over a decade, the students and teachers at Nisqually Middle School have been involved with this good Christmas cheer project have gotten a good life lesson about giving. They discover it’s satisfying to know they’ve helped and that giving has its own gift – a sense of satisfaction. When she’s sitting around her Christmas tree as home, Coleman knows it’s pretty neat to know she’s blessed somebody through Nisqually Middle School’s adopt a family project. The reason Nisqually Middle School has done this over the years is to put a happy face on families who are in need over the Christmas season. And it’s to give the families who donated and the ASB students who have heled a sense of satisfaction, too. Putting a happy face on a needy family is what makes the ASB students happy to know they’ve helped. Courtney Tapia, a seventh grader at Nisqually, shares that same drive. She also wants to be able to help. She likes the impact of helping a family around Christmas. In addition to giving gifts and food to school families in need, Nisqually Middle School also does other helping hand drives around Christmas. They do a sock, coat, and blanket drive right before Christmas. Kids get to take those items to the Thurston County Food Bank and other shelters.